O.J. Simpson celebrating with teammates after breaking the 2000 yard mark for rushing in a season, December 16, 1973. Before the glove that didn’t fit, the casino holdup and the introduction of the word “Kardashian” into America’s vocabulary, there was Dec. 16, 1973. A man ran 200 yards through a blizzard at Shea Stadium. You’re probably familiar with the name — but before O.J. Simpson was Prisoner No. 02648927 in the Nevada Department of Corrections system, he was No. 32 for the Buffalo Bills. “The Juice,” said Mike Montler, the team’s center. While some remember him as the Juice, more remember him for other alleged exploits. Whatever your view, one fact remains: 40 years ago Monday, Simpson broke Jim Brown’s single-season rushing record. It was like being the first man to climb Mt. Everest or break the speed of sound — but on the anniversary, you hardly heard a peep. You watch film of him dashing through the snow and immediately get flashbacks of the low-speed Bronco chase. Even old teammates look at the hobbling old man in the prison jumpsuit and can’t help asking. “What the hell happened?” Montler said. We don’t know exactly what turned No. 32 into No. 02648927. (Simpson’s attorney said his client isn’t doing interviews these days.) However, we do know what happened four decades ago. Six other backs have broken 2,000 yards in a season, all since the NFL went to a 16-game season in 1978. Simpson is still the only one to gain 2,000 yards in 14 games. O.J. Simpson carries the ball down the field at Shea Stadium in his record-setting game against the New York Jets. Simpson studied blocking schemes and knew where his linemen would be. He had that sixth sense of knowing where tacklers might appear. He could change directions without losing speed, and he usually had more of that than anyone else on the field. The best a defender could hope for was to grab an arm or leg and hold on until help arrived. Simpson was at the peak of his powers in 1973. Brown’s record of 1,863 had stood for 10 years. Because it was Jim Freakin’ Brown, the number had a mythical quality. As Simpson closed in, the Football Gods did what they could to protect it. 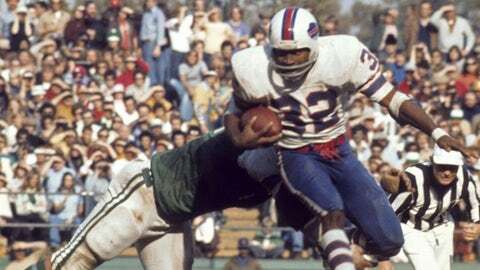 There was a snowstorm in Buffalo on Week 13, but Simpson skidded through it for 217 yards. 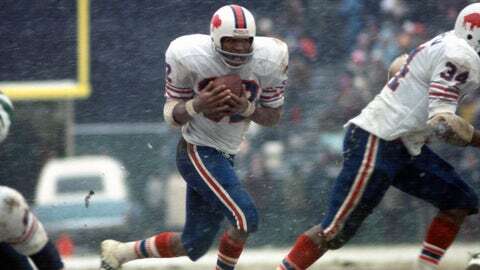 The weather wasn’t much better a week later when the Bills faced off against the New York Jets — and Shea Stadium was a bad field when it was 70 degrees and sunny. The Jets were determined not to be the patsy in this drama. They didn’t quite conjure up a Dream Team defense. Simpson needed 61 yards to break Brown’s record. He got that on a six-yard run with 4:26 left in the first quarter. The referee gave him the ball, and Simpson unceremoniously jogged over to the sideline and handed it to a manager for safekeeping. “More, Juice, more!” his teammates chanted. His longest run of the day was 30 yards, pedestrian by O.J.’s standards at the time. But, by the start of the fourth quarter, that 2,000 yard record was in sight. His linemen were Reggie McKenzie, Don Green, Paul Seymour, Joe DeLamielleure, Dave Foley and Montler. Bob Chandler and J.D. Hill were blockers as much as receivers. Jim Braxton was a wrecking-ball fullback. They comprised The Electric Company (turn on the Juice, get it? ), and knew what they had to do. "[Simpson] could change directions without losing speed, and he usually had more of that than anyone else on the field. The best a defender could hope for was to grab an arm or leg and hold on until help arrived." “The attitude basically was no official was going to throw a flag when O.J. is carrying the ball,” Montler said. The Bills did a lot of holding and clawing and slapping. The Jets returned the treatment, but history wouldn’t wait. A seven-yard run broke the 2,000 barrier. Teammates lifted Simpson onto their shoulders, and he triumphantly raised his left fist. There was still 5:56 left in the game. “I was thinking, ‘Let him run some more,’” Ferguson said. The Bills were way ahead, and nobody foresaw a 16-game season where some extra yards might keep Eric Dickerson or Barry Sanderson or Adrian Peterson at bay. Simpson left and was immediately grabbed by the NFL public relations staffers. They’d set up an interview area in a boiler room. Simpson told them he wanted his teammates to join him. “I’ve got to get my boys,” he said. He was told the room was way too small. Simpson said no boys, no O.J.. They all came in, ducking beneath the exposed pipes and surrounding the star. “These are the cats who did the job all year long,” Simpson said. Before the Dream Team of Johnnie Cochran, Robert Shapiro, F. Lee Bailey and Robert Kardashian, Simpson owed his freedom to the Electric Company. “He was a great guy,” Montler said. When the Bills showed up for training camp the next July, Simpson gave each of his Electric Company helpers a gold bracelet. It had their name, number and an inscription. 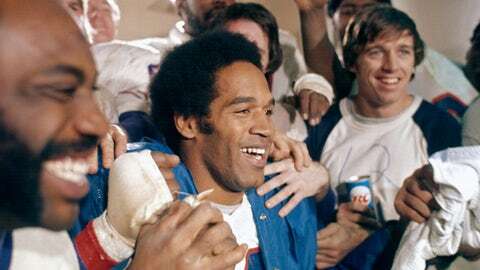 Forty years later, at least that’s one thing everybody can agree on with O.J.